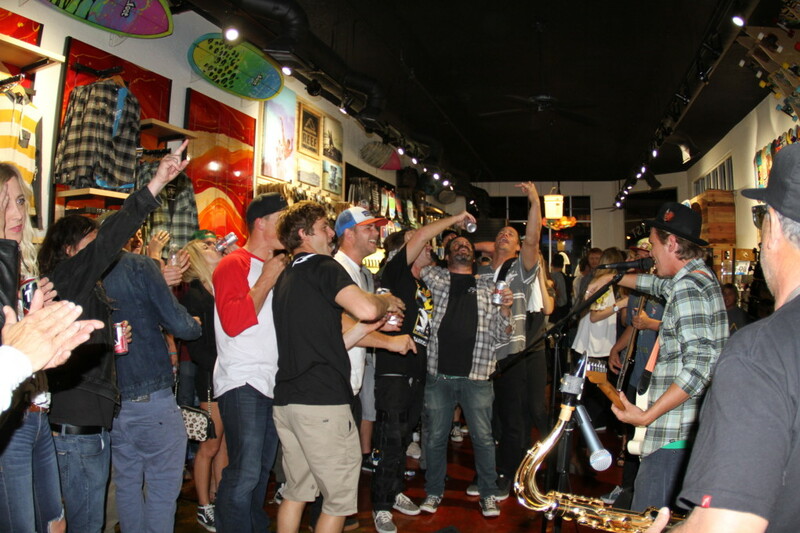 3/3/15: The grand opening party at the new Catalyst in San Clemente went down last Thursday. We had a few kegs, some cheap wine and a lot of good people to enjoy them with. Located at the “Triangle”, the new shop boasts a “Resinworks” theme complete with resinated floors, resin swirl wall panels and even a resin bucket chandelier. The party also featured …Lost surfboards by the Lucky Bastards, an indoor glassing demo by E-tech, new Mason Ho clips and a live performance by Tunnel Vision. We also gave out a ton of free …lost clothing to the kids. Check out the photos and make sure to check out the shop. Catalyst San Clemente, Raised on Resin since 87′. The new store is located in what San Clemente locals call “The Triangle”. Basically there are bars and parties all the time. Metal Jimmy stamp of approval. The store. Those floating resin buckets are actually a chandelier. Mike Reola and Matt Biolos, and the boardroom. Live glassing demo from the boys at E-tech. Ian Crane at the beer pump. Banzai Bard pouring up some Acai Vodka shots from Banzai Bowls next door. Andrew Fitzsimmons, Masaki Kobayashi, and Biolos smiling for the camera. Fake ID check practicing with Colt Ward and Griffin Colapinto. San Clemente up and coming grom David Economos. Special K with some chick hidden under his shirt. Watch out were waiting for Tunnel Vision to go on. Greyson Fletcher showed his beard for a little. Lucky Bastards American edition Couch Potato. The DJ before Tunnel Vision with his fake joint. Scott Russo hanging with Hayden Hanson of Tunnel Vision. New fin display at the shop. The Depactus crew came to have a few beers. Rick Downes and his lady. Metal Jimmy serving up a beer for her. Shaw Kobayashi and Brandon Hawkins. Couple of the groms got free boardshorts for coming to the party. Devon Cooper Striking a pose. Anastasia and Malia Ward came to check out the party. With hid patented war cry. Somehow he got everyone to wail with him. Thunder and Special K feeling it. Sax player Doug Alani in between songs. Bean Dip and Joe Alani. The front of the store had a bit more of a mellow vibe. Randy, Fitzy and Dougie excited for the camera. A couple ladys admiring the American flag resinwork by the Lucky Bastards. The Lost crew taking the party out back . The boys approve of Tunnel Vision. Nudo’s middle finger and Bailey.